Get ready for one of the ultimate puzzle games released on the Android platform! We are excited to present to you Smart Connector - Connect 4, a lovely puzzle game developed by Net Prospection. If you want to challenge yourself and have fun along with it, this game is a must for you. It is easy to play, designed with friendly user interface and well picked colorful backgrounds and characters. Smart Connector - Connect 4 has simple gameplay and interesting storyline. Once you download it, you will quickly learn how to play because it features a tutorial at the beginning. 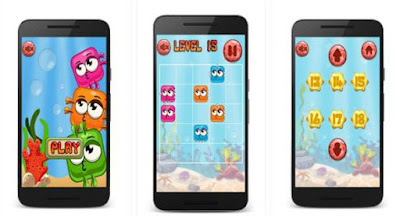 The cute fishes are lost in the sea and you need to help them connect. You do that by moving or rotating them. The blue fish that can change its location without turning, the pink fish can rotate without changing its location and the orange one can both change location and rotate. Connect them and try to win as many levels as you can – there are 99 challenging levels built-in this incredible game. Appealing to all ages and designed only for your entertainment, the Smart Connector - Connect 4 game will train your brain, challenge you and addict you to the fullest. Download it now for free from Google Play.